Are These Oral Flea And Tick Preventives Safe? 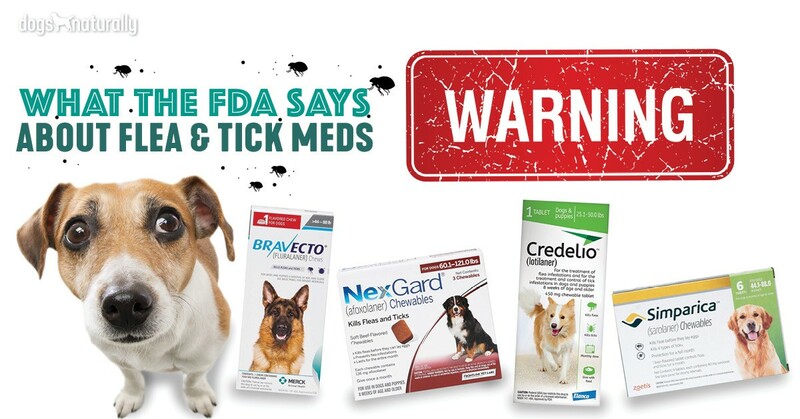 Home > Blog > Remedies > Bravecto, Nexgard And Simparica: Are These Oral Flea And Tick Preventives Safe? Like every dog owner, you want to avoid fleas on your dog and in your home. And you don’t want your dog picking up ticks and risking tick-borne disease. Wouldn’t it be convenient to just give your dog a tasty chew every month or three months to protect her from fleas and ticks? Well, recently, some new flea and tick prevention products for dogs give you the opportunity to do just that. Don’t jump on these drugs too fast. They have a dark side. What Are The New Drugs? There are three drugs in the category of oral flea and tick preventives: Nexgard, Bravecto and Simparica. Nexgard (active ingredient afoxolaner) and Bravecto (fluralaner) were approved in the US in late 2013 and early 2014. Simparica (sarolaner) was just introduced in March 2016. The dosing schedules are once a month for Nexgard and Simparica and once every three months for Bravecto. These flea treatments are oral medications. The drugs come in a soft chew your dog can eat like a treat. 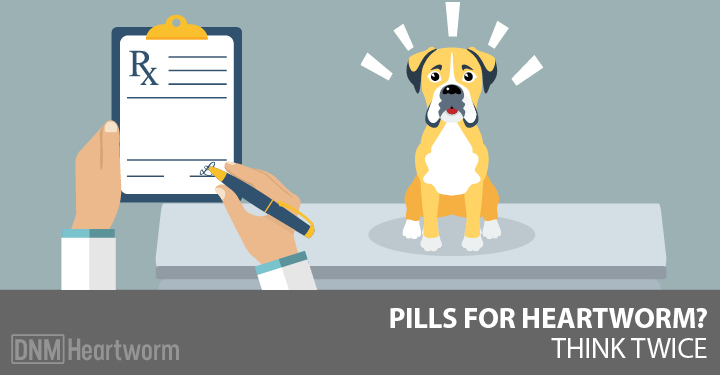 After your dog takes the chew, the drugs circulate in the blood, and when a flea or tick bites your dog, it’s exposed to the chemical. This exposure will kill fleas and ticks. All three drugs are pesticides that work by attacking the nervous system of the fleas and ticks, causing death. The statements below describing the Mode of Action of these drugs are from the manufacturers’ Prescribing Information. So, these drugs work by destroying the insects’ nervous systems. If it’s deadly for fleas and ticks, how might it affect a dog? It remains in your dog’s bloodstream for extended periods of time, after all. And, once your dog takes one of these drugs, if she has any side effects, you can’t remove the drug from her body. Every drug has side effects and I wanted to find out what reactions dogs might have had to these meds. My first stop for this type of information is usually the US Food and Drug Administration (FDA). 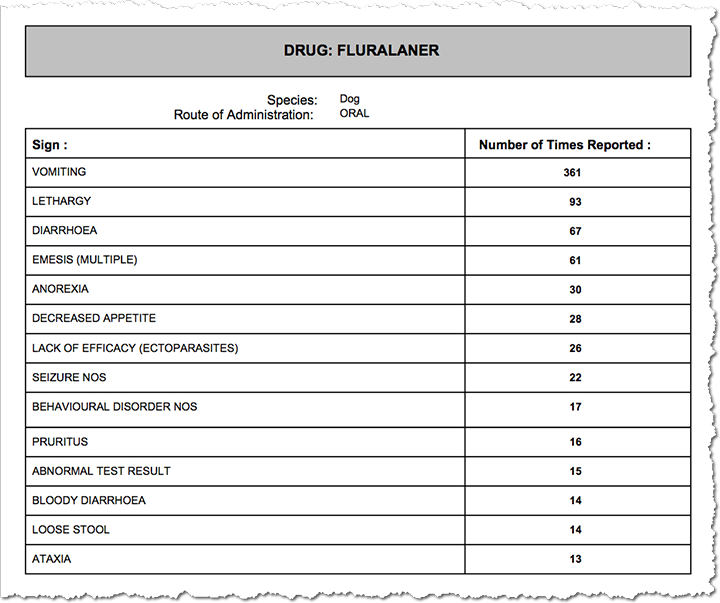 The FDA collects Adverse Drug Event Reports on its website. But I was out of luck. Because these oral preventives are relatively new, the FDA doesn’t list them yet in the Adverse Drug Event (ADE) reports on their website. So there’s nowhere “official” you can research the side effects dog owners and veterinarians have reported from these drugs. Luckily, however, I came across some useful information, thanks to veterinarian Dr Elizabeth Carney. Back in November 2014, when Nexgard and Bravecto were first introduced, Dr Carney wrote about the new drugs on her blog. And then she started receiving comments from people whose dogs were already experiencing side effects after taking these preventives. She wanted to find out more. So she filed a Freedom of Information Act (FOIA) request to obtain the reports and has now received a number of ADEs for Nexgard and Bravecto. Dr Carney has generously made these reports available on her website, so I took a look at them. There are no reports yet for Simparica as it’s too new. There are specific ADE reports for Nexgard and Bravecto for the period January through March 2016. The results are very similar for both drugs. Vomiting, lethargy and diarrhea are the most common side effects reported. Seizures are quite high on both lists, with 22 each for both Nexgard and Bravecto for the first quarter of 2016. Nine deaths are reported for each drug for the same period. For Nexgard, five of the nine deaths were by euthanasia. Facebook is another source of information about the side effects of these drugs. These two pages contain many tragic stories from dog owners who believe their dogs have been harmed by Bravecto and Nexgard. Some of the posts are fascinating as well as alarming. One poster reports finding dead ticks on her dog as long as 12 months after his last dose of Bravecto … suggesting that’s how long it stays in your dog’s bloodstream! So again, a reminder that if your dog experiences an adverse effect, you can’t just stop using it and expect your dog to return to normal! 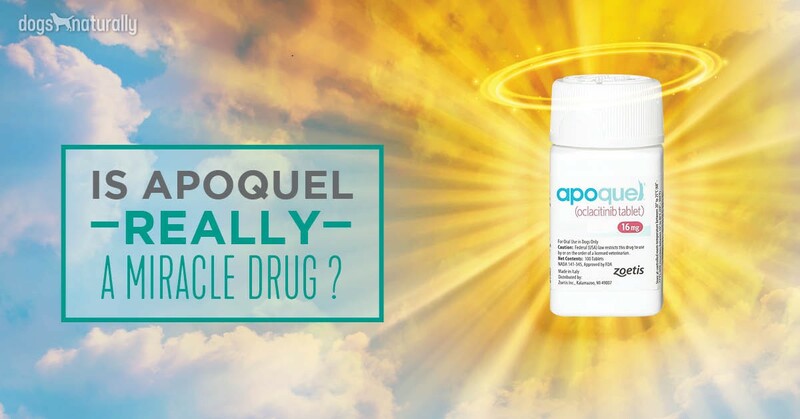 As you saw from the Prescribing Information above, the mechanism of this drug is just like Bravecto and Nexgard – it destroys flea and tick nervous systems. So it seems likely that this drug’s adverse effects will be similar to the other two drugs. Dr Carney, who obtained these reports from the FDA, told us that she has personally decided not to use these drugs for her own dog, nor will she prescribe them to her clients. If you want to avoid these and other potentially harmful pest preventives for your dog, check out the recipes in this article for some great ways to protect your pet naturally from fleas and ticks. Is Your Yard Safe For Your Dog?